Update errors aren’t a novelty in the Windows OS history. Some of them are easy to resolve, while some of them are quite a challenge. Today we’ll try to address an error that goes by the code 0x8007001F. 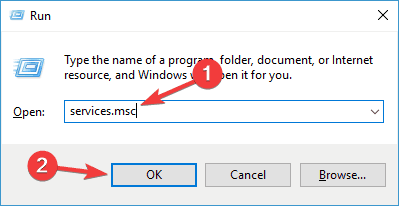 This error is closely related to audio drivers and it prevents users from updating in Windows 10. There are a few possible workarounds applicable to this problem, so follow these steps and, hopefully, we can work it out. 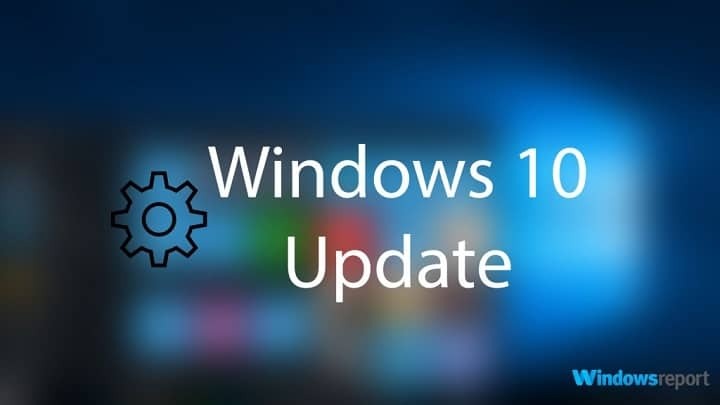 Windows failed to install the following update with error 0x8007001f – This error is usually caused by third-party applications, and if you encounter it, try disabling your antivirus or perform a clean boot. Windows 10 update assistant error 0x8007001f – Sometimes your drivers can cause this problem to appear, therefore it’s a good idea to update crucial drivers before trying to update Windows. 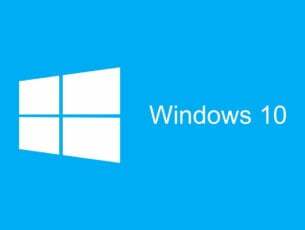 Update error Windows 7, 8.1 – Update errors can appear on older versions of Windows as well. Even if you’re not using Windows 10, you should be able to apply most of our solutions to the older versions of Windows without any problems. Although your antivirus will offer protection from malware, sometimes it can interfere with your system and cause 0x8007001F error to appear. To fix the problem, it’s advised to change your antivirus settings and disable certain features. If that doesn’t help, you might have to temporarily disable your antivirus. In worst case scenario, you might even have to remove your antivirus from your PC. Many users reported that both Norton and McAfee can cause this error to appear, so if you’re using one of these tools, be sure to remove them. Although these two applications are the most common cause of this error, other antivirus tools can cause this issue as well, so be sure to remove them. If removing your antivirus solves the problem, it might be a good time to consider switching to a different antivirus solution. If you’re looking for a new antivirus, you might want to consider BullGuard. This application offers great protection, and it won’t interfere with your system, so feel free to try it out. Now navigate to Sound, video, and game controllers section and right-click your audio device. Choose Uninstall device from the menu. A confirmation dialog will now appear. If available, check Remove driver software for this device. 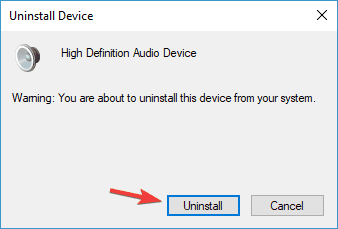 Now click Uninstall button to remove the driver. After doing that, you should try to download the latest drivers for your audio device. Simply visit your motherboard or sound card manufacturer’s website and download the latest drivers. After updating your audio driver, check if the problem is resolved. In order to avoid permanent damage to your PC by downloading and installing the wrong driver versions, we strongly recommend TweakBit’s Driver Updater (approved by Microsoft and Norton). This tool will automatically download all the outdated drivers on your PC. In Services list, search for Windows Update. Right-click and open Properties. Now choose Disabled as Startup Type. 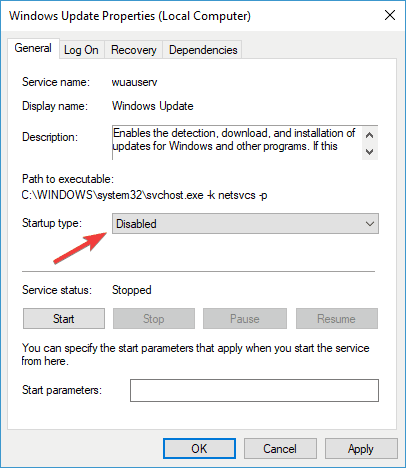 Check out Services again and make sure that Windows Update is Disabled. Navigate to C:\Windows and find SoftwareDistribution folder. Rename folder to SoftwareDistribution.OLD (you can delete it, as well but why to take unnecessary risks). 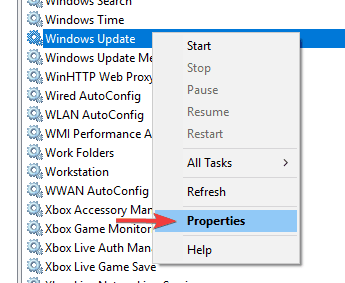 Once again navigate to Services and find Windows Update and, in Properties, change Startup Type from Disabled to Manual. Go to Start and open Settings on the left side. Open Update & Security and check for updates. Have in mind that you’ll need administrative access in order to change/delete system folders. This procedure proved as a valid solution for multiple update errors. However, if the problem is persistent, move on to the next solution. Press Windows Key + X to open Win + X menu. Now select Command Prompt (Admin) from the list. You can also use PowerShell (Admin) if Command Prompt isn’t available. When Command Prompt opens, run sfc /scannow command. SFC scan will now start. This scan can take up to 15 minutes, so don’t interfere with it. Once the SFC scan is finished, check if the problem is resolved. The system update malfunctions are closely related to file corruption. Namely, due to malware infections, some of the system files can get corrupted or quarantined. For that reason, DISM (Deployment Image Servicing and Management) can be used to scan and resolve this issue by repairing broken files. 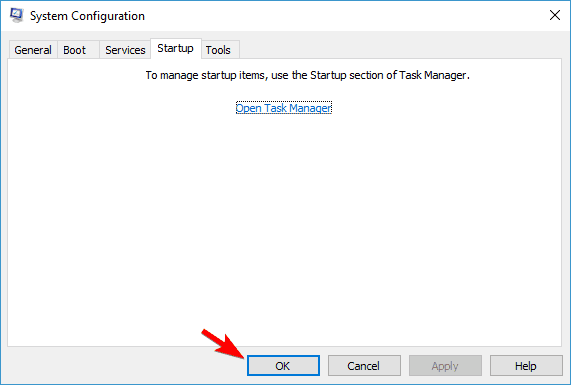 Right-click on Start and run Command Prompt (Admin). Make sure that you replaced repair source path with your own. System Configuration window will now appear. Go to Services tab and then check Hide all Microsoft services. Now click Disable all button. 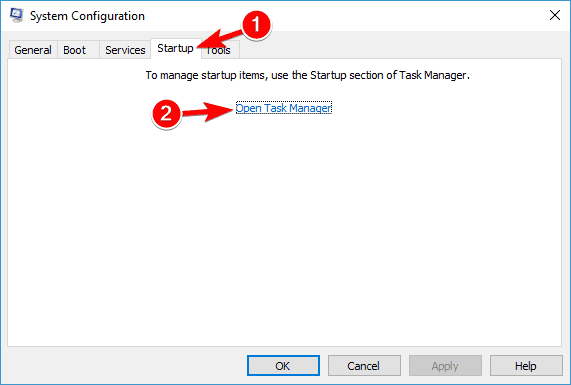 List of startup applications will now appear in Task Manager. Right-click the first item on the list and choose Disable from the menu. Now repeat these steps for all startup items on the list. 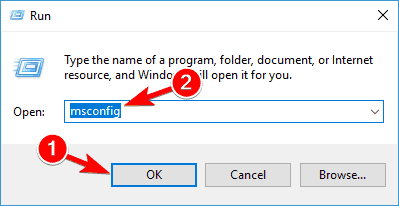 Go back to System Configuration window and click Apply and OK to save changes. 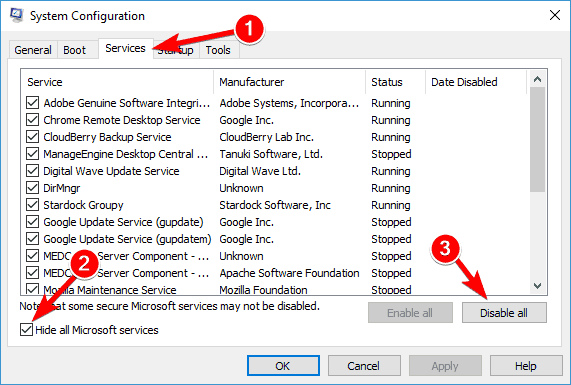 Once your PC restarts, all startup applications and services will be disabled ensuring that third-party applications don’t interfere with the upgrade process. After disabling all these services, you should be able to upgrade without any issues. When Settings app opens, navigate to the Accounts section. In the left pane, select Family & other people. In the right pane select Add someone else to this PC. 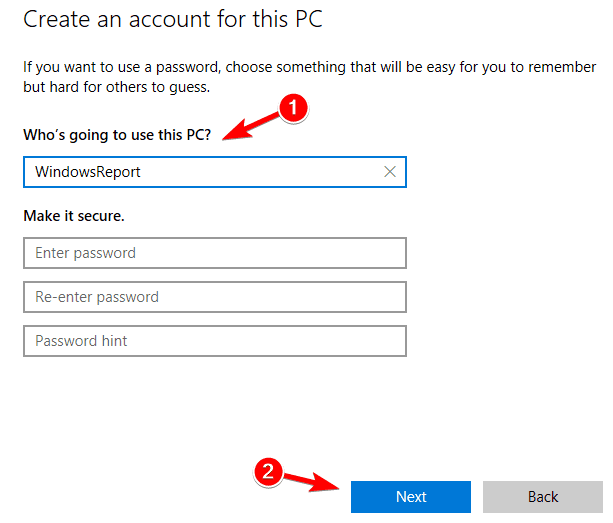 You’ll be asked to create a Microsoft account. Select Add a user without a Microsoft account. Now enter the desired user name and click Next. After creating a new account, switch to it and check if the problem is resolved. Download Media Creation Tool and run it on your PC. Wait while the application prepares your system. Follow the instructions on the screen until you get to Ready to install screen. Now select Change what to keep. Once the process is finished, you’ll have the latest version of Windows installed, and all your files and apps will be preserved. That should wrap it up. Your error should be resolved if you followed these instructions closely. In case you have some questions or additional workarounds, please be sure to inform us in the comments section.